A best-selling book, a long-running stage production, and a hit film adaptation starring Daniel Radcliffe – it seems that The Woman In Black, based off the short story by Susan Hill, is a mini-franchise in and of itself. However, with the inevitable movie sequel (spurred from the popularity of director James Watkins’ first film above all else) it’s already starting to show signs of franchise fatigue. 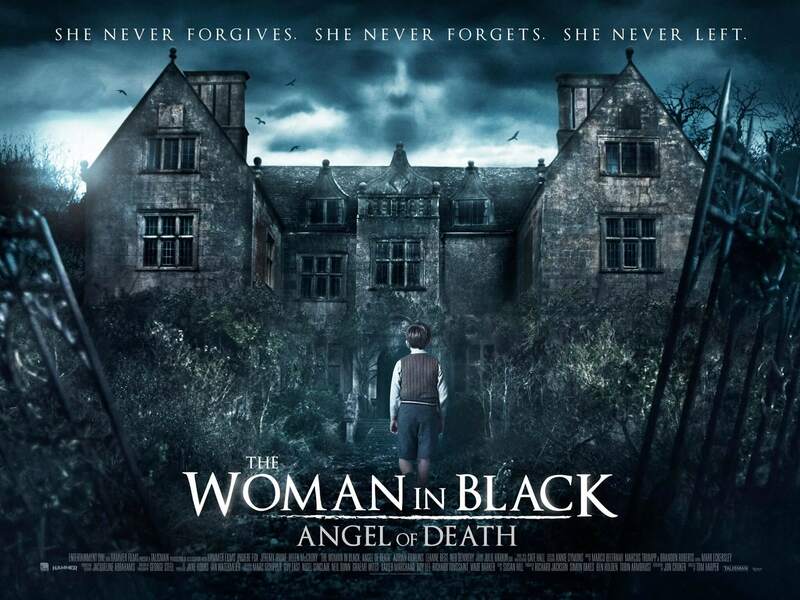 Not that The Woman in Black: Angel of Death – with director Tom Harper taking over from Watkins – lacks any merit whatsoever, in fact there are a small number of things one can admire about the film. For instance, cinematographer George Steel manages to conjure some very gothic and atmospheric shots from the locations used in the film, from the enlarged lake surrounding the Eel Marsh estate where the majority of the action takes place to, of course, the house itself. In short, haunted houses have never looked so hauntingly pretty to look at. There is also some decent acting across the board, although this element can at times be hit and miss. Jeremy Irvine is a stand-out as an RAF pilot who helps the group of war evacuees with their paranormal complications, trying his hardest to mine for melancholy and likability within the otherwise-underwritten role he’s been given; but Phoebe Fox unfortunately cannot carry the weight required for her lead role as a schoolteacher, and the usually reliable Helen McCroy is stuck with little to do but provide a cynical stick-in-the-mud counterpart. As for the Woman in Black herself, played this time by Leanne Best, her screen time is considerably less than it was first time around which, for a sequel titled after her character, makes her feel like a minimal supporting player in her own film. Normally, the reduced screen time of the titular threat would be a thoughtful step to take, adding to the suspense and the tension of the overall environment. However, this sequel proves time and time again that it is nowhere close to being on-par with the original, lacking the pure threat and even scares to withstand redundancy in the plot and the inability to care about the people that this is all happening to. What made the previous film, and by extension author Susan Hill’s original source material, so effective was its minimal presentation on the screen; just having Daniel Radcliffe facing the ghostly threat on his own allowed the atmosphere to close in and create an uncomfortable and – yes – frightening sense of dread even if nothing was truly there to get him. For some reason, the sequel feels it needs to stick to the mantra of “the bigger, the better”, and as a result instead of one person facing the threat it’s multiple people, many of them young and obnoxious children; because of this, it feels more like a standard haunted house film where you’re spending more time picking out who the next person to die is than caring about the people themselves. As morbid as that sounds, especially when there are children involved, it nonetheless robs the film of any tension or suspense that made Watkins’ film so effective and popular in the first place, something that Harper simply doesn’t quite grasp when attempting to fill his shoes. If you’re a fan of jump-scares then you will find much to admire with this film, since it soon becomes apparent that it is heavily reliant on nothing but them. This can be another problem for everyone else, since they are not necessarily what made The Woman in Black so effective to begin with; as stated, the chills came from the environment and surroundings within the house and even when there were jump scares they were mostly minimal and highly effective because of it. That is something that Harper once again doesn’t manage to convey for his sequel, and if he did then he has certainly overindulged on that device. As if it keeps trying to remind you that you’re watching a horror film, it feels the need to put in as many false threats designed only for a quick and cheap scare as possible, and it can become very irritating after a while; even much so that you find yourself predicting when the next scare is going to come in and swoop at you instead of being sucked in to the story or characters. The overuse of the jump-scare device masks the redundant feel of terror and horror, especially post-Babadook which proved you don’t need to scare the audience at every waking opportunity to be frightening; a lesson that The Woman in Black: Angel of Death could certainly be taught. The Woman in Black: Angel of Death is a standard example of how the “bigger, better” mantra doesn’t always guarantee creative success, losing much of what made James Watkins’ previous film a memorable and even unsettling experience in terms of suspense, tension, character and even scares to justify its existence as a follow-up or even as its own film.